You are here: Home / News / Melissa on Sammy Hagar's Rock & Roll Road Show! Melissa on Sammy Hagar's Rock & Roll Road Show! LOS ANGELES – February 9, 2017 – Hit the road with The Red Rocker, as AXS TV presents season two of the popular original music series ROCK & ROLL ROAD TRIP WITH SAMMY HAGAR PRESENTED BY MERCURY INSURANCE, premiering Sunday, March 5, at 9pE/6pP. The 12-episode season follows Hagar as he travels to notable music cities throughout the U.S. to interview and jam with some of his legendary friends in music including John Mayer, John Mellencamp, James Hetfield (Metallica), Mick Fleetwood, Rick Nielsen (Cheap Trick), Joe Satriani, and Melissa Etheridge. Season two is split into six-show cycles and kicks off with a special hour-long premiere. All other episodes will be 30 minutes long. This marks the second consecutive year the network has partnered with Mercury Insurance on ROCK AND ROLL ROAD TRIP WITH SAMMY HAGAR as the series’ title sponsor. San Francisco— Season two kicks off in Hagar and James Hetfield’s hometown where they turn the camera on the star-studded 3rd annual Acoustic-4-A-Cure – the benefit concert they founded. The concert event, at the world-famous Fillmore Theatre, is one of the year’s hardest tickets to score and is open to TV audiences for the first time on AXS TV. 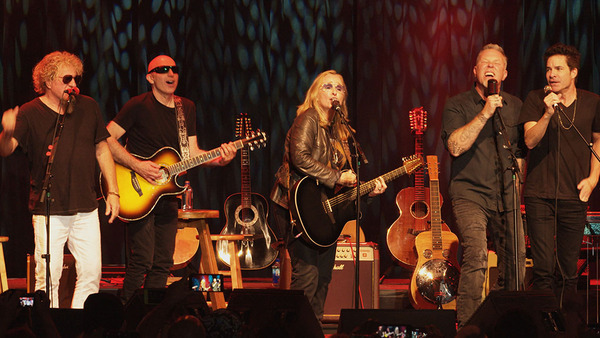 During the one-hour premiere Hagar interviews Hetfield, Joe Satriani, John Mayer and Melissa Etheridge — leading into epic jams with Hagar, Hetfield, Mayer, Tommy Lee, Satriani, Etheridge, Pat Monahan, Vic Johnson and more (March 5). More information about other episode and the show can be found here.